I recently saw some photos over at Lick the Bowl Good that made my mouth absolutely water...strange right? But honestly, Monica made a couple of pork tenderloin with a delectable sauce that had me clicking bookmark! I actually hadn't cooked pork tenderloin for some time when I found her recipe, so maybe that made it even more tempting? I think what really sold me were the fabulous studs of garlic spread out over the whole tenderloin. If you know me at all, you probably remember that I am a garlic fiend. Either way, I made it a few days later and thought I'd share the delicious recipe with you now. Preheat oven to 350 degrees F. Rinse tenderloins and pat dry. Place in a 9x13 Pyrex sprayed w/ pan spray. 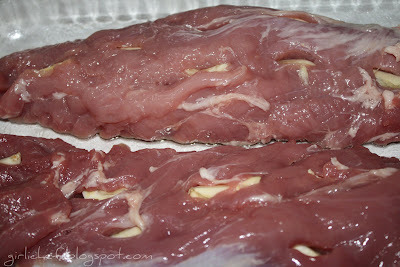 With a paring knife, poke (~16) 1" slits in top-side of tenderloins. Insert a sliver of garlic into each slit. Mix together remaining (marinade) ingredients in a separate bowl (I did it in my 2 c. measure). 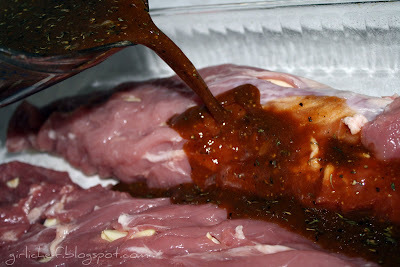 Pour marinade over the pork. Place in preheated oven for 35-45 minutes (overdone pork is icky, so start checking early, especially if you have a hot oven), uncovered, basting halfway through. Remove from oven and let sit ~10 minutes before slicing. Serve with the lovely pan juices spooned over the pork. This was a lovely dinner...actually served with mashed potatoes and green beans...(not pictured...oh really?). My favorite part was definitely the studs of garlic...I will probably leave the mustard out next time and sub in something (undecided) else because it was a little too mustard-y for me...but still moist and delicious. Go check out Monica's other tasty recipes...she makes the best desserts, too! This looks incredible - I'm definitely trying this recipe!!! Can you believe that we BOTH made watermelon margaritas yesterday!! I cracked up when I saw your post - this happens to me all the time. I sure enjoyed them and your margaritas look yummy too. They're really good combined with strawberries too. I am loving this and loving having a new pork loin recipe (I'm in a pork-loin rut!). Gorgeous, gorgeous and delicious. This is really beautiful! I love the Dijon and rosemary in this. I bet it smelled fabulous while it was cooking! It looks great the way you've plated it up at the end too! This looks absolutely company worthy, special occasional worthy. Thanks, Heather, for sharing this recipe! You just can't beat a good pork tenderloin. I love leftovers in sandwiches. 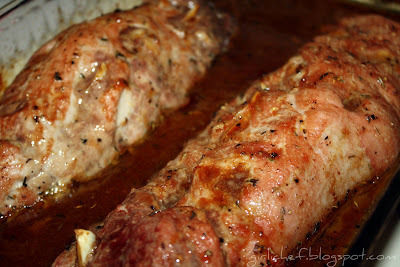 What a yummy way to prepare pork tenderloin. I could lick the screen it looks so good. Even better, I just happen to have a tenderloin in the freezer. Your recipe sounds good for a Sunday dinner. Thank you my friend. Beautiful presentation! Yum! So tasty looking! That's a pork tenderloin done right! We love pork at our house so this would be a huge hit! Oh yum! (I say that a lot over here, LOL!) We definitely have a love of the same kinds of foods! I've got to get back in the kitchen and back to cooking up some good stuff to share! What gorgeous pork. That is hard to improve upon. This is a really nice recipe. I haven't made pork tenderloin in ages either. Mostly because one of my kids refuses to eat pork. The marinade sounds wonderful...especially the garlic (I absolutely love garlic too!!). Instead of mustard....what if you used horseradish and cut the quantity in half? ...Yum! That sounds good, Danielle! I bet this was wonderful! I always contemplate whether or not I want to buy a pork loin, but am always reluctant, b/c I've yet to find a recipe that I really liked. Can't wait to try this one! Oink, oink!! This looks so good, a nice, tasty comfort meal! Oink,oink! 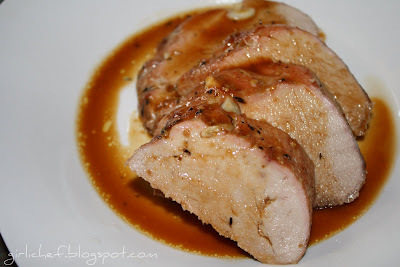 Your pork loin looks wonderful--love all the garlic! What a delicious looking pork tenderloin! Love all the wonderful flavors here! That is my Favorite pork cut, and very close to the way my mom use to make it when I was a youngin'. So Flavorful! Aw, thanks for the shout out! Your pork tenderloin looks great too. I'm so glad you liked it! I saw this recipe and thought it was fabulous too. Yours looks just as pretty. Pork and garlic are so great together. This looks AWESOME and pork is my FAVORITE!!! I'll definitely be trying this soon!